The Monroe County Correctional Facility is home to a growing number of opportunities for inmates. There’s a greenhouse, art therapy, animal care, and, as WXXI’s Brett Dahlberg reports, there’s also an increasing number of counseling services – in particular, for unsentenced women. “All I know is I was in a very dark place,” Sam Luzius said, sitting on a couch in the community room of the YWCA building in downtown Rochester. Luzius had entered the Monroe County Correctional Facility as an inmate last year, feeling broken and defeated. But she’s out now, and she credits the support of jail counselors for her survival. “Jail saved my life,” Luzius said. Sam Luzius counts herself as a Monroe County Correctional Facility success story. She lives now in the YWCA's supportive housing community in downtown Rochester. Luzius, 26, spent a bit more than four months in the correctional facility last year. Her starting point was a complete mental collapse, she said. Not long after that, still in the throes of addiction, Luzius got in trouble for stealing. She went to jail. And she met Frankie Sampson. Sampson is one of a growing number of counselors employed by the Monroe County Sheriff’s Office to work with inmates at the jail. Luzius, now out of jail, is in recovery from addiction and working to regain custody of her son. She said that’s only possible because of the mental health and addiction recovery support she got in the correctional facility. Sampson, a drug and alcohol counselor by training, is now working specifically with unsentenced women at the jail. “It’s a population that can really use some special support,” she said. The term “unsentenced” covers a range of people at the jail. It runs from those who have recently been arrested and accused of a crime but haven’t yet seen a judge, to those who have been convicted of a crime but not yet received a sentence. Dr. Tisha Smith, who is in charge of drug and alcoholism programming for the Monroe County Correctional Facility, explains her calendars to a reporter. Sampson was one of two new counselors hired in April. Tisha Smith, Sampson’s boss, said more are on the way. Smith oversees drug and alcohol programming for the sheriff’s office. 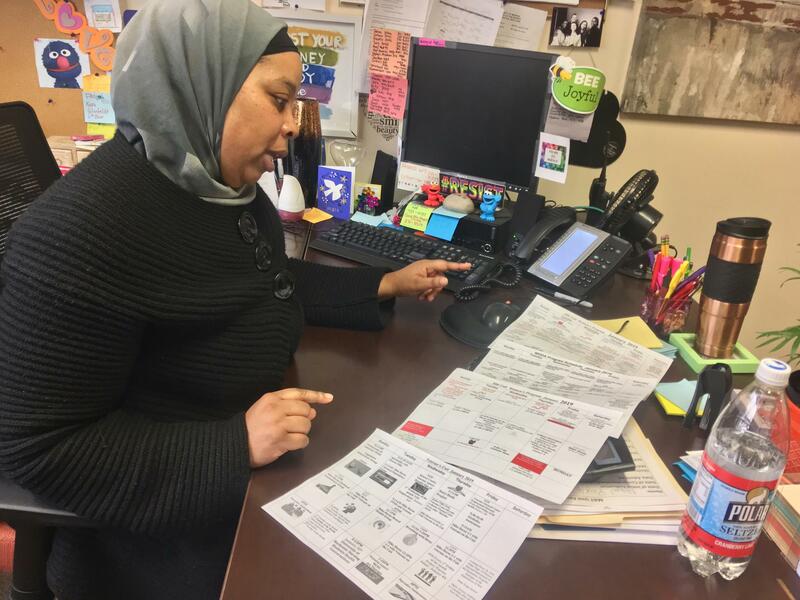 She keeps a full schedule – too big to fit on one calendar – of activities and programs that she says are available to inmates. There’s morning meditation, yoga, veterans’ groups, counseling, art groups and vocational training, to name a few. Emphasizing rehabilitation over punishment isn’t new in the Monroe County correctional system, Smith said, but the resources available to her are increasing substantially. “We have grants; we have people asking us to come work with inmates; we have new staff,” she said. One foundational aim of those packed calendars is to keep inmates busy, Smith said. Smith said the activities provide ways for inmates to pass their time in jail and help them prepare for life when they get out. Smith and Sampson both said that preparation is especially important for unsentenced women. Those women, often held to social standards that expect them to be caretakers and household managers, suddenly find themselves cut off from the families and children they’re supposed to be supporting, the jail workers said. Many have a substance abuse disorder or addiction, Smith said, though she noted that’s common across inmate populations. Making things harder, said Sampson, is the unpredictability of the unsentenced women’s situation. “They could be out tomorrow,” she said. Or they could end up in drug court, or they could receive a sentence that keeps them incarcerated for years. Smith said the counseling she’s prioritizing helps prepare unsentenced women for their release. She asks them to dig deep into their personalities and their pasts, and find triggers for dangerous behaviors. Luzius went through that process with Sampson. Despite the difficulty, Luzius said she is on her way to being a success story and is committed to recovery from addiction. Now, Luzius has an apartment in supportive living at the Rochester YWCA. Supportive living connects residents with social events and continued counseling and social services. It’s a marked change from Luzius’s past. “I’m learning how to live again. I have never lived a normal life. I’ve never worked for my means. What I know is doing drugs, stealing, lying,” she said. Luzius said her change in attire reflects a change in attitude.